Anyone who likes modern television blockbusters is really going to be thrilled with this model from Vizio. You definitely need to see the picture quality on this TV to believe it. With this amazing picture quality and lots of other great features, the VIZIO M55-C2 will turn your living room into a movie theater. You will never have to worry about murky and dark images again. This TV set enhances the viewing experience, and makes the most of amazing cutting edge technology in order to bring your favorite movies and shows to life like never before. By using the latest smart technology in combination with very fast streaming, users are able to watch all of their favorite and regular channels as well as download content from well-known streaming sites. In addition to all this, this TV is a perfect choice to use with the popular, next generation of game consoles, bringing you into the heart of the game with impressive visual and audio capabilities. 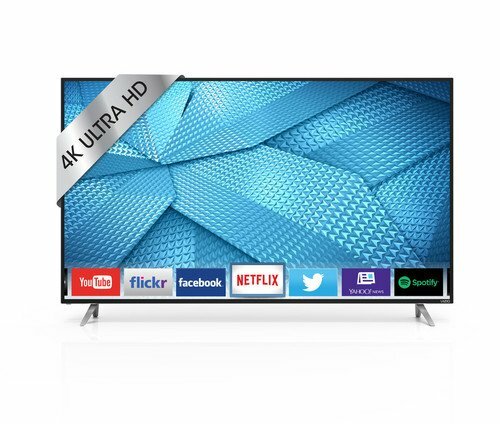 The way we watch TV has changed in a big way, and this TV allows you to stream everything you love from Amazon, Netflix, and other sources directly onto this beautiful VIZIO M55-C2’s 55-inch screen. Using the super fast, latest WiFi capabilities (maximum throughput of 1300 Mbps), you will hardly ever notice a buffering or lag. In fact, it is up to 3 times faster than some standard WiFi rates. If you like to watch shows like Game of Thrones, you definitely need to see it on a quality, big screen like this one. The VIZIO M55-C2 4K TV 55- inch screen is huge, so you will really see all the details and effects of your favorite shows. Despite its generous dimensions, it loses nothing of the picture’s precision and clarity. We all know HD pictures are great, but 4K or Ultra HD takes picture quality to the next level. This technology is going to become essential in the following years, and thanks to the TV expertise of Vizio, you can take advantage of this technology right now. This Vizio Ultra HD picture quality is so impressive that many users think it takes on nearly three dimensional effect. One of the most important and notable features of this model as well as the whole Vizio M-series is the 32 zones of LED full array backlighting-a system that outrivals edge lit backlighting in several important ways, such as much better black levels and contrast in certain situations as well as improved side angle viewing quality. Black levels appear very saturated, while once calibrated, colors look amazing as well. This TV offers many amazing things in the picture category.